Jonathan Edwards (right) in action for Posh. Photo: Joe Dent/theposh.com. It’s striker Edwards’ second spell with ‘The Saints’ this season. The 19 year-old scored three times in his first spell at the club. Harry Anderson in action for Posh against Charlton earlier this season. Photo: Joe Dent/theposh.com. 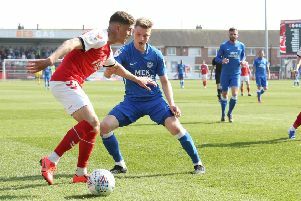 Midfielder Anderson (19) has just returned from a stint at National League side Braintree for whom he made one start and one substitute appearance. St Albans are next-to-bottom of the Natioanl South Division. They are away to Bath tomorrow. Anderson has made 17 appearances for Posh, but none since the 1-1 League One draw at Port Vale in October when he was a second-half substitute. Edwards made three Posh appearances at the end of last season, but he was sent off on his full debut in the final match of the season at Oldham.